It's midnight and we are just back from the hospital. They stuck a little stick waaaaaay up his nose and it showed positive for the flu pretty quickly. and this then made us have to wait for a chest xray as it was very likely that he had pneumonia as well, but he did NOT, which is amazing. But we were at the hospital so long (four and a half hours) that he could have used another treatment before we left. And look! The teeny juice cups are too little for him! It's probably his last visit to the pediatric ER. The end of an era. The Attending was looking at his chart and said: gee, it looks like he's been admitted a lot...he's had asthma since he was a baby? And then Youngest talked about never knowing he had asthma. He's such a good guy and now (at 12:17am) he's had three double strength treatments, a triple dose of prednisone (only done in the hospital so they can watch his heart rate), two cups of apple juice and some graham crackers. But he's so excited to be able to go to the last day of school. All he wanted was to be able to go to the last day of school. And me? I'm having a glass of wine while I try to figure out if we gave him his flu shot too late (ten days ago). But look at him! 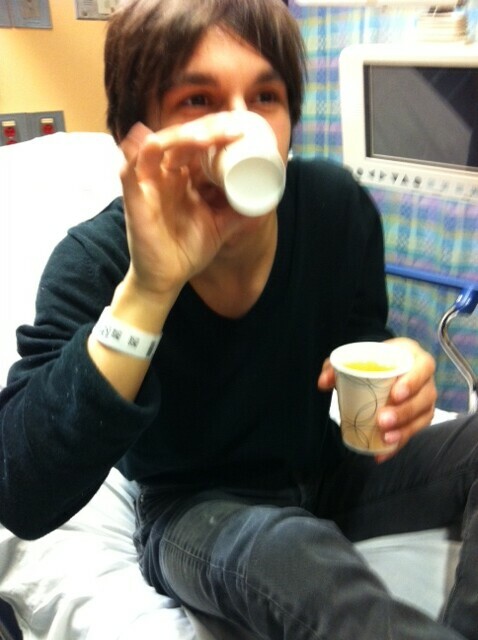 He looks happy, even if in the hospital for the umpteenth time. What a great guy! He's got it over with BEFORE Christmas - which is very thoughtful of him. I think he should get the credit for that. All I can think -- aside from being glad Youngest is okay and clearly happy -- is that YOU SHOWED US HIS FACE! Thank you. Poor middle.. and while only his eyes are showing, it is clear that you have a very handsome man on your hands... I hope he feels better! But the eyes are everything! I have seen into Youngest's soul!! Glad it's not the Pn-word. Feel better! "stuck a little stick waaaaaay up his nose" ugh! Thats how they test for flu? Gross city!!! Poor kid, I'm uncomfortable just reading about it. Seems like I've done Prednisone before. Is that the stuff that makes you bruise like a banana? Glad he's doing better. How's the rest of your family? Is Oldest doing better? After this weekend, I'm reminded how difficult a job being a parent is. I don't think a glass of wine would be ebough, unless its a VERY big glass! Monday morning...I hope Youngest is feeling a little better today. Daughter and her boyfriend have had mild cases of it, but so far haven't passed it on to anyone else. Youngest looks so grown up. Also, I loved the photo of the stars in your dining room. Phew, that's quite a day. I am glad that he is home and hope that he is doing better. I adore the photo of him with the teeny juice cups, there is something truly delightful about it.